The study examines changes in religious upbringing, identification, and behavior among children of intermarriage across three generations. 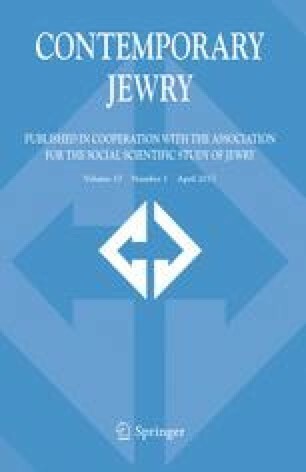 Drawing on data from the 2013 Pew Research Center’s survey of Jewish Americans, we show that children of marriages between Jews and non-Jews in the Millennial generation are more likely than older counterparts to have been raised Jewish and to have received a formal Jewish education. Further, as a result of more widespread Jewish upbringing and education, they are more likely to identify as Jewish in adulthood and practice some aspects of Judaism. We attribute these developments primarily to the more welcoming and inclusive attitudes and practices toward intermarried families by Jewish organizations during the 1980s and 1990s. We discuss the study’s implications for Jewish demographic continuity and for the study of the dynamic interplay between intermarriage and religious affiliation. Heilman, Uriel. 2013, October 1, Pew survey of U.S. Jews: Soaring intermarriage, assimilation rates. Jewish Telegraphic Agency. http://www.jta.org/2013/10/01/news-opinion/united-states/pew-survey-u-s-jewish-intermarriage-rate-rises-to-58-percent. Accessed 1 May 2014. Kenny, David A. 2015. Mediation. Retrieved from http://davidakenny.net/cm/mediate.htm. Sasson, Theodore. November 11, 2013. New analysis of Pew data: Children of intermarriage increasingly identify as Jews. Tablet. http://www.tabletmag.com/jewish-news-and-politics/151506/young-jews-opt-in. Accessed 1 May 2014. Wiener, Julie. January 28, 2014. The intermarriage debate is flaring up (again), months after Pew survey.” The Forward. http://forward.com/articles/191770/the-intermarriage-debate-is-flaring-up-again-month/?p=all. Accessed 1 May 2014.